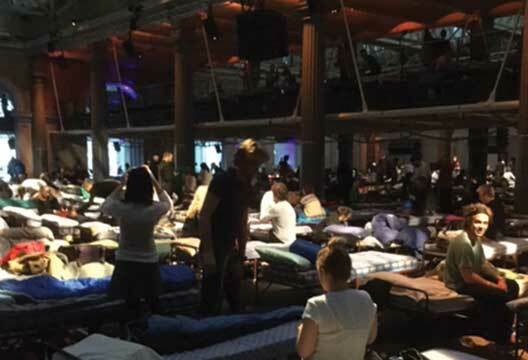 Pamela Jacobsen emerges well rested from sleeping with the fishes: experiencing Max Richter's 'Sleep' at Old Billingsgate, London. The most extraordinary thing was the waking. It happened all at once; sudden, yet somehow not jarring. I was instantly immersed in a wall of sound that vibrated through my body. The grey dawn had broken. All around me my fellow ‘sleepers’ had begun to stir. There was a sense of coming back together; a re-gathering after the night’s dreaming has scattered us far and wide. People ruffled their sleep-tousled hair; stretched, yawned, and began to sit up in bed. A sense of anticipation was building. I checked my watch – 6.58am. In 2 minutes’ time, the musicians on stage, the Max Richter ensemble, would have played us a lullaby for 8 hours straight. You are not ordinarily actively encouraged to fall asleep during a concert. You are also not ordinarily encouraged to come ready-dressed in pyjamas, toting sleeping-bag and pillow. But then Max Richter’s ‘Sleep’ is no ordinary composition. An overnight performance from the Wellcome Collection in 2015 broke records as the longest single continuous piece of music ever broadcast live on the BBC. Richter, a prolific and award-winning contemporary composer, described Sleep as a ‘lullaby for a frenetic world’. He consulted with neuroscientist David Eagleman in its conception; Richter was fascinated in what we know about sleep, its processes, purpose and structure. Sleep is perhaps the ultimate enigma – we know we have to sleep, but we still don’t really know why. Richter’s piece feels timely. There seem to be more threats than ever to a good night’s sleep in the modern world. Concerns about the impact of the use of electronic devices on our sleep are prevalent, in particular for children and adolescents. A large cross-sectional study in Germany, led by Karoline Lange, recently reported that adolescent boys who reported more than 8 hours screen time a day were also more likely to report sleep difficulties. Causation is difficult to disentangle of course; it may be that poor sleepers use electronic devices more because they can’t sleep, rather than the other way round. As a mental health professional, I’m also aware of the high prevalence of sleep difficulties in people who use psychiatric services, and how these are sometimes overshadowed by a focus on other symptoms. There are signs of increased attention to the importance of sleep however, even when insomnia is not the primary complaint which brings people into services. For example, Daniel Freeman and colleagues have shown in a 2015 Lancet Psychiatry paper that eight sessions of cognitive-behavioural therapy for sleep improvement is effective in people with a schizophrenia-spectrum diagnosis. The Barbican were in charge of the production for Sleep, and had found a wonderful venue in the grand hall of the former fish market at Old Billingsgate by the River Thames. I arrived excited but oddly apprehensive. I consider myself lucky in that I’m generally a good sleeper. However, like most people my sleep is very sensitive to my emotional state, and I often don’t sleep well if I’m stressed or upset about something. What if I didn’t manage to sleep at all? What if a miserable night of self-inflicted insomnia might follow? As so often is the case, my night-time fears were unfounded. The production team had obviously put a great deal of thought into the arrangement of the camp beds, the temperature of the large hall, the soft purple lighting. I settled down comfortably with sleeping bag and pillow. I did wake several times in the night; but only briefly, gently drifting up and down through layers of consciousness. I woke in the morning with a sense of ease, as if the music had cocooned me safely all night. I was left thinking that Richter’s masterpiece is more than a lullaby; it’s also a love song, to that most soothing of all balms – a good night’s sleep.